When stock of this product is depleted, this SKU will be replaced by 0970264306 (Black) or 0970264321 (Natural). The Classic Design CN models combine the easy playability and distinct tone of nylon strings with the comfort of steel-string spacing. We’ve replaced the typically wide necks normally found on classical guitars with the same easy-playing neck profile found on all other Classic Design models. As a nod to tradition, the CN-140SCE uses a solid cedar top, along with rosewood back and sides for a warm and mellow tone. 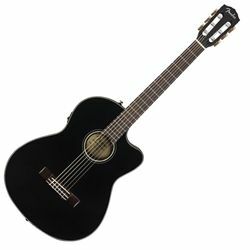 The CN-140SCE provides a supremely comfortable experience for players of any skill level—the ‘thinline’ concert body makes it a perfect guitar for the living room and stage alike, while the single cutaway makes it easy to access higher frets. When the need to plug in arises, this model’s onboard Fishman® electronics provide straightforward, yet powerful tonal control.